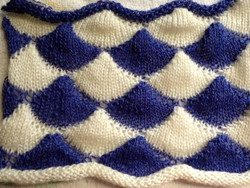 There are multiple ways to achieve knit and purl combinations on the KM. Brother garter carriage will do so “automatically” albeit slowly, ribbers may be used in combination with main beds, ladders may be latched up by hand, or one may use the garter bars to turn work over. When large widths are required the options are to use multiple panels, or to knit the fabric sideways letting the width become the length. Some HK fabrics are impractical if not impossible to duplicate on standard home knitting machines, and compromises are chosen. I tried to create a distant relative of the proposed trim, with a bit of family resemblance. Below the short section to my garter bar is pictured. I mark every 10 eyelets with nail polish on my GBs to help with tracking stitch counts (do same with centers of ribber combs). 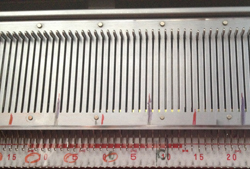 The photo shows it in the position in which it needs to be held to take stitches off the machine prior to turning them over. The hollows under the eyelets (1) provide room for the needle hooks to slip under the yarn and catch the stitches when work is flipped over. Hollows under eyelets occur on the side with the convex ridge (2). There are many online sources for using the bars, now available in multiple gauges, including an article by Susan Guagliumi. 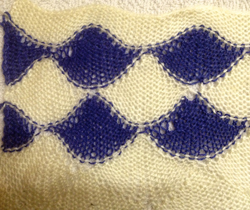 COL: knit one row across all stitches, carriage moves to right (pink). I find it easier after holding starts to move the carriage to opposite side by taking it physically off the machine and leaving settings alone, results in fewer yarn tangles and problems for me. COR: set machine for hold except for first 2 stitches on right. I tried one stitch at a time first, but the wedge was too deep, so I began working bringing stitches to hold 2 at a time, carriage side first. 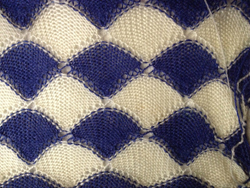 Stitches could be held opposite the carriage as well, but that created a set of additional holes when one returns to knitting those stitches in the opposite direction, and a pointy edge (segment marked with dot #2, more on a later post on miters and spirals). 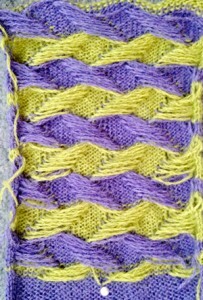 The number of stitches brought to hold can be varied as needed, the goal here is a symmetrical result. 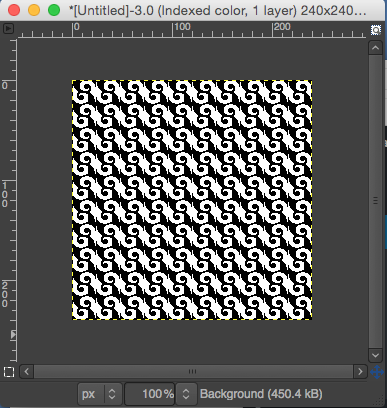 I began the sample with 5 rows in between the mitered shapes, and then tried 11. This is labor intensive if produced in significant lengths, so a choice can be made depending on personal taste and patience. 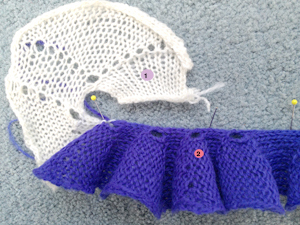 Though it could be attached as one knits the item it is intended to trim, there is enough going on I would probably estimate the length, take it off on waste yarn, and hang it onto the larger item. If longer, the trim may be unraveled to suit. If an addition is required it may be added on but at least working with the much larger bulk of materials will not be for the duration. Holding lever may be set to knit for single passes prior to turning work over in sections using holding, or stitches may be pushed into work by hand. Youtube video channel for Knitalong Cafe. I am a fan of color symbols for techniques both in hand and machine knitting. Had thought about starting a thread on using color in cable charting, but someone else has already done a great job of writing on some of the topic’s details. See Eunny Knit! The above begs many questions. 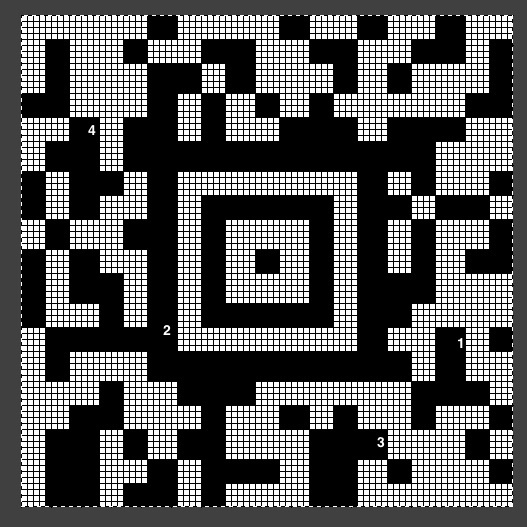 Upon investigation it appears there are 18 2D bar code variants, some static, some dynamic. 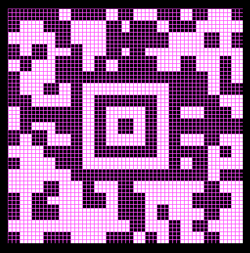 Qrme is a UK site that provides information on trackable QR codes, forums and more. Their page shows scaled in size codes modules. 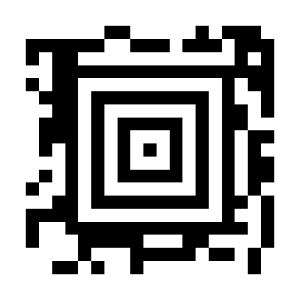 XnConvert is a free software file conversion program. Long time Passap users may remember discussions on use of its sibling, XnView in early KM PC days. 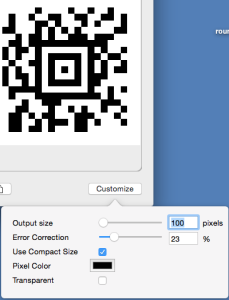 Convert for the Mac runs in OS10.8. 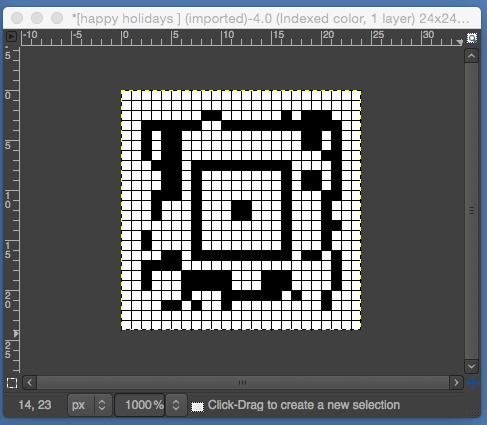 A friend requested a Passap.cut file from me. 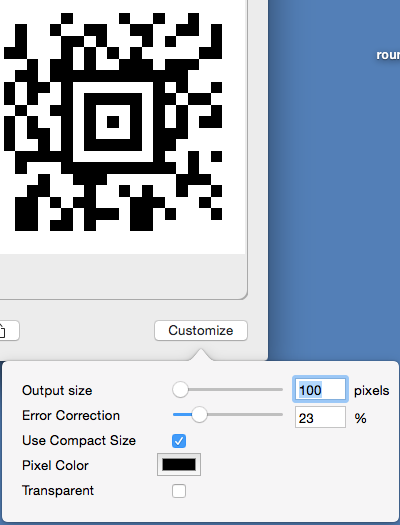 Graphic converter (not free) did not handle even the file viewing when I was trying to verify file integrity before e mailing. Convert read the same file, and offered a variety of format options for saving. 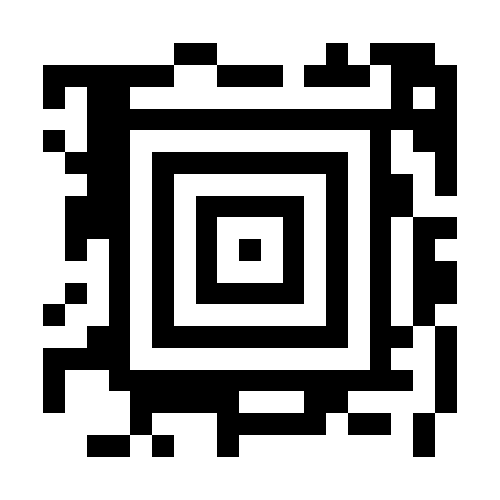 I have been able to use the program to convert pal easily, but not any DAK Pat or Stps. Very early Madag cuts were not recognized, but the libraries available dated by months were. A mixed bag, but this may be a convenient way to create an easily viewed thumbprints library for .cut patterns otherwise identifiable only by their names or launching their design program. 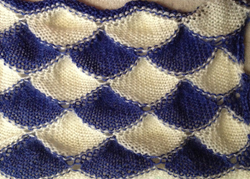 This is another fabric combining holding and slip stitch to create shapes. 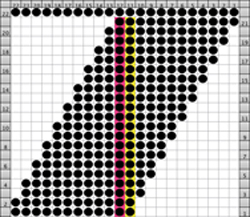 Below is my working first repeat, the colored lines indicate a dividing line that would give me a black square on either side for setting up the second, split repeat to reverse the direction of the knit stitches. 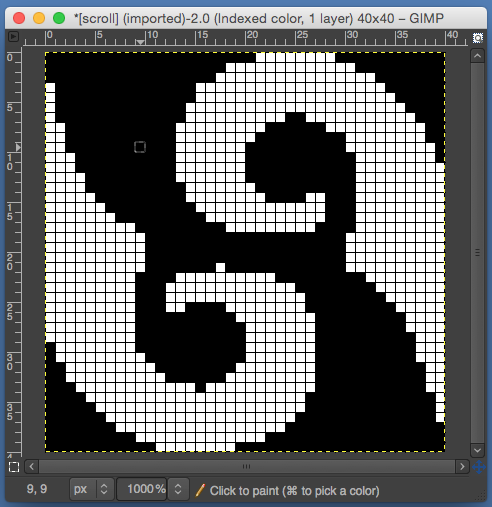 I am sharing not to provide a pattern or specific how to, but to provide some ideas for technique experimentation by blog readers with some experience and familiarity with the use of patterning and holding conjunctively. COR for bottom mylar repeat KCII <- knit all stitches color A, COL set machine to slip <->, bring all but first 22 sts on left to hold, knit 20 rows. 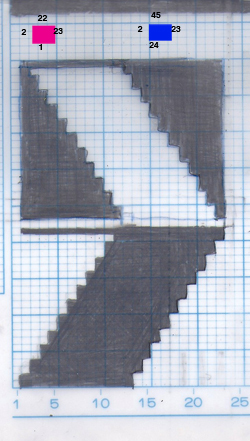 The resulting shape is being created left to right, when the top is reached the stitches at the left of the sequence will be in B position, the ones on right will be in work. 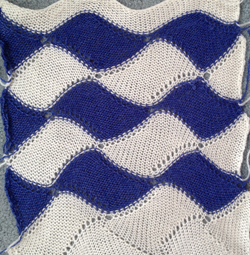 COL: at this point push next 22 sts into work, knit to right. 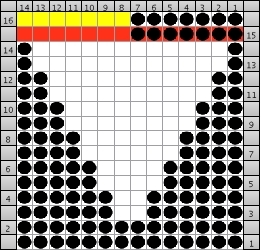 COR: return first repeat 22 sts to hold position, continue in pattern for 21 rows. 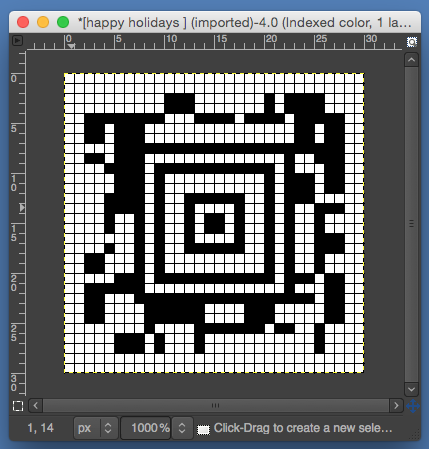 COL: bring next group into work, and knit/move across selected number of needles. COR: bring previous grouping of 22 into hold. Repeat as needed for desired width. 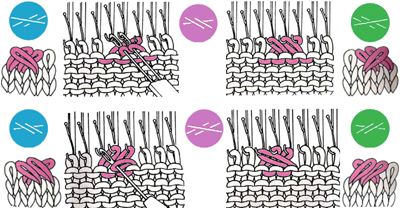 When row is completed and the last group of needles is selected in work, COR: cancel holding and slip, knit one row on all stitches to opposite side, change color to B if desired. 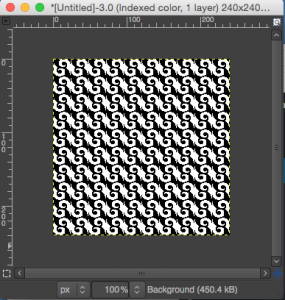 COL: program subsequent repeat, KCII, select ->. 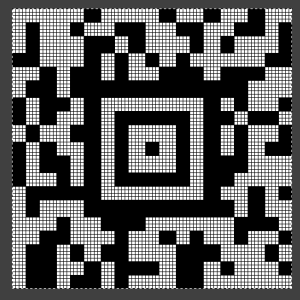 COR: set cam buttons to slip <->, KC to hold, bring all but first 22 needles on right into work and reverse full sequence. 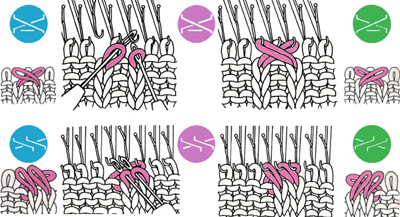 This technique combines holding with the slip stitch setting. 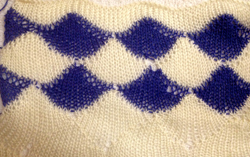 When KC is set to slip it is the punched holes/black squares that result in needle selection and stitches knitting. 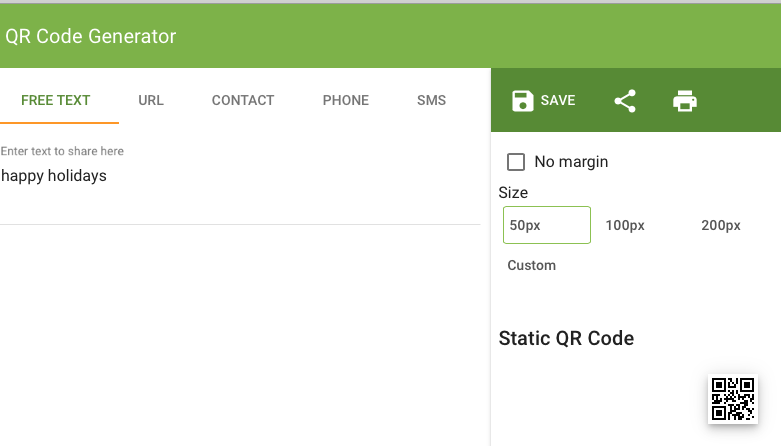 Blank areas in cards or mylars are slipped/ skipped. 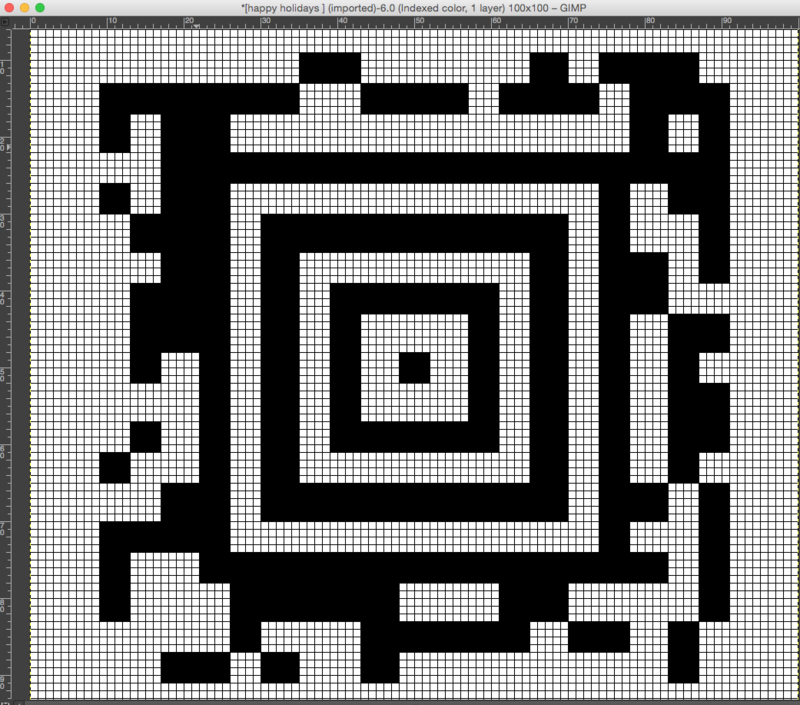 A bit on method: the repeat used for the hand technique in the previous post was changed to an even number of rows, with other adjustments. To match casting on and binding off I often start with waste yarn, make the decision as to how to end piece in a way that I like based on my test swatches, then rehang the stitches from the first row and treat them as I did those in the last row of knitting. For forming a straight edge at the sides of the finished piece, the first horizontal row of shells must start and end with half a repeat. Set up is on a multiple of 14 stitches. I began working with COR. Stitches are brought into hold consistently on the side opposite to the carriage, when 1 remains at top of half repeat (2 for full repeat), the remaining six of the recently worked repeat and subsequent 14 for the following repeat are pushed into work (21/22 sts), one row is knit across all needles, COL, the 7/8 remaining stitches from previous group are brought out to hold, carriage travels back to opposite side once again on grouping of 14 stitches, COR, holding pattern resumes opposite carriage, and from right to left. 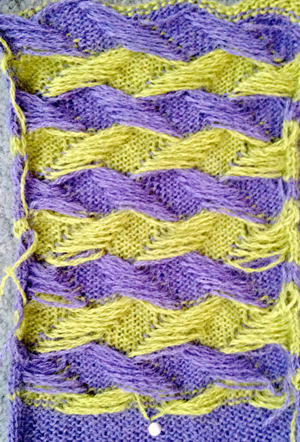 The contrasting color in the second horizontal row of shells begins on left, working on a full 14 stitch repeat, reversing the shaping. 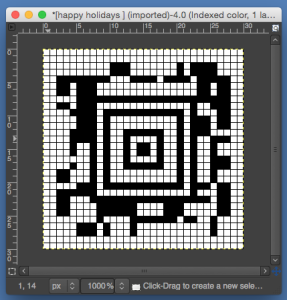 I am considering automating the process with slip stitch and holding option. 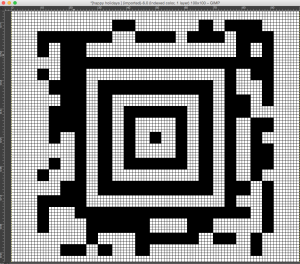 The latter would have to occur on an electronic if repeat is to be used as is, since on a punchcard the width would need to be adjusted. 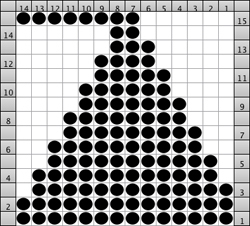 If a brick repeat such as above is desired, two different cards or programmed repeats would need working out for the alternate shapes to occur on the same location on the needle bed after completion of each horizontal shell sequence. It can be helpful to mark up a needle tape or even the needle bed with water soluble markers to keep track of the repeat’s locations. 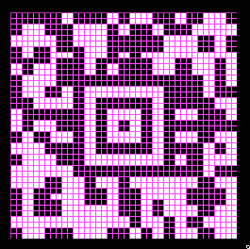 I used separate color for each repeat set. A bit of denatured alcohol on a lint free cloth piece easily removes them. Markings on needle tape pertain to some of my other projects. if changing color by hand, please remember to “close the gate” after each color change to avoid dropping knitting off the machine if/when the yarn in use moves too far forward to be “caught/knit” by needles in D (Brother KM). 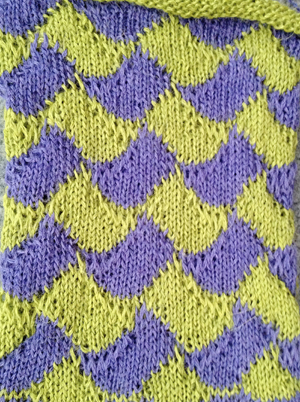 With necessary adjustments in starting row and settings, technically this fabric may be knit on any KM brand. 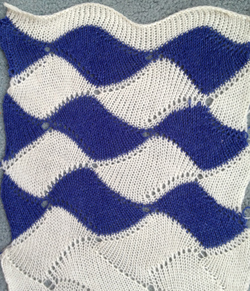 The yarn I used is the same alpaca/silk blend used in my shawls, tension 6. 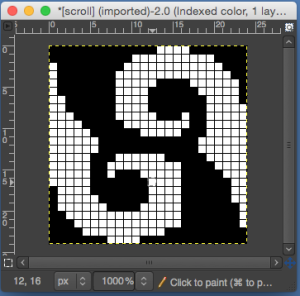 If color changer is used, KC row must be from right to left with knitting rows moving left to right and back to color changer. The following begin to address cable translations. I posted some content on cables January 2012 , but this content follows the present vein. 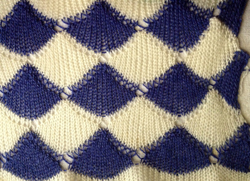 Blue dots continue to represent the hand knit symbol, below them the fabric as viewed on knit side. The pink dots and the images on either side of them the machine knit, or fabric as viewed from purl side. In the column on the far right the green dots and the images below them represent the opposing twist in HK or knit side.